The FIBA Americas Championship for Women is the American Women's Basketball Championship played on a biannual basis between national teams from different continents. It is one of the most important competitions in basketball as it takes the form of a global tournament where only the best national teams of each continent have the honour to compete for gold. The FIBA Americas Championship includes sub-zones, e.g. Central America, the Caribbean and South America, and North America which send their best national teams to compete in the Americas championship. All of the sub-zones have pre-qualification tournaments prior to the Americas tournament. The 2013 FIBA Americas Championship for Women was hosted in Mexico, at the Gimnasio USBI in Xalapa which proved to be an excellent host in terms of organization. The qualification tournament lasted for 7 days as usual, from 21 September to 28 September. The tournament was a pre-tournament for American FIBA women to qualify for the 2014 FIBA World Championship for Women in Turkey. The organizers and participants were very pleased with Xalapa, Veracruz as the host of one of the most important tournaments in women sports in the world. Xalapa is the capital of Veracruz with a population of almost half a million inhabitants, and the city had prior experience with organizing sports events, like the FIBA Americas League in cooperation with the University of Veracruz including Final Fours in 2008-2009 and 2010-2011. The countries that participated in the FIBA American Championship in 2013 included countries from both Americas. They were: Canada, Jamaica, Cuba, Puerto Rico, Mexico, Dominican Republic, and four teams that qualified in a separate South-American FIBA tournament, including Brazil, Argentina, Chile, and Venezuela. After the countries qualified in their sub-zone qualifications, they were divided into two groups of five and played against each other in two phases based on the draw held in San Juan, Puerto Rico in the same year. The groups were Group A and Group B. Group A included Canada, Cuba, Venezuela, Chile, and Jamaica. Group B encompassed Brazil Argentina, Puerto Rico, Mexico, and the Dominican Republic. Only the top two teams had a secure outlook advancing towards the finals, whereas, the 3rd and 4th team had to play against each other for the third place to qualify for the World Championship (along the USA National Team which qualified automatically). The remaining seven teams had to go home without a ticket to the FIBA World Championship the following year. Canada, Puerto Rico, Brazil, and Cuba made it to the semi-finals. Canada played against Puerto Rico and left the poor Puerto Ricans way behind with a final score of 73-48. Cuba played against Brazil and did not win persuasively as Canada, with the end result of 72-68. Brazil and Puerto Rico played for the bronze medal, and Brazil took the third place by defeating Puerto Rico with the score 66-56. The final match, between Canada and Cuba, was held on 28 September 2013 whereby Cuba won with an 8 point advance by the end. The final score was 71-79 in Cuba’s favour, leaving Canada with the silver medal to enter the World Championship. Cuba remained unbeatable in 2013, just like the three years before that. The four-time forerunner in the Americas championship for women was once again not willing to hand over the gold medal. The USA qualified automatically as the Olympics champion and was not part of the qualification competition. The other three teams that went to Turkey in 2014 with the USA national team were Brazil (3rd), Canada ranked 2nd, and Cuba- the 4-time winner of the FIBA Americas Championship for Women. 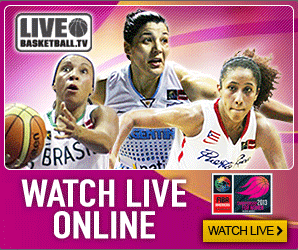 THE FIBA Women's Basketball World Cup is the most significant basketball tournament for females at the global level. Every four years, the national teams of the best countries in basketball, participate in the biggest basketball sports event. FIBA stands for the International Basketball Federation which was founded in 1953. The upcoming FIBA tournament is only one year away since it is planned for 2018. The name FIBA Women's Basketball World Cup is a newly acquired name for this kind of tournament. Until 2014, it was known as the FIBA World Championship for Women. The cycle of the tournament matches the FIFA World Cup as it also takes place every four years and overlaps with this newly renamed basketball tournament. The Women’s Basketball World Cup is the biggest sports tournament in basketball, and in order to qualify, the countries take part in pre-qualification tournaments which are arranged by continent. So we have the FIBA Americas Championship for Women, FIBA Oceania Championship for Women, FIBA Africa Championship for Women, EuroBasket Championship for Women, and the FIBA Asia Championship for Women. That site is sponsored by the new online casinos, check it out here.